This column is frequently used to both praise the many in our church who are passionately involved in serving our congregation and our larger community, as well as encouraging all members to become involved with an activity sponsored by the church beyond just our Sunday services. Whether you like to write, make music, garden, read books, cook food for those who are in need of a hot meal, or meet and greet others, there’s an activity for you at UUCC! On a larger scale, we also want to encourage all in the congregation to engage in our long-term goals and mission. This happens in multiple ways, with one certainly being giving as generously as possible during our annual stewardship campaign. It is only through these annual pledges that we can continue to offer the kinds of programming that sustain our membership and encourages others to join us. Another large-scale participation that is important is attending our full congregational meetings, especially our upcoming annual meeting that will be held on May 5. This meeting will focus on passing our annual budget and voting on new board members, and it will also feature an important presentation from SOA, the architectural firm we have hired to assist us with renovations in the church. SOA will take a portion of the meeting to guide us through some fact-finding and solicit feedback from the entire congregation in order to develop a prioritized needs list. I can assure you that an elevator is absolutely already on this needs list, but we need to prioritize other items as well. This is your opportunity to be part of that process and to have your voice heard. Mark your calendar for May 5 and be sure to attend! Stewardship update – we did it! 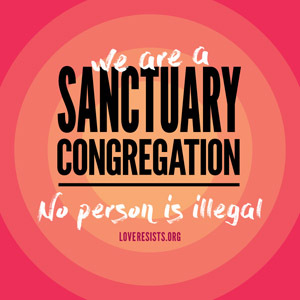 In April 2017 our members voted to become a Sanctuary Congregation. Read more. 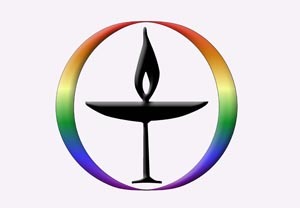 The Rainbow Chalice is emblematic of our recognition by the Unitarian Universalist Association as a Welcoming Congregation for lesbian, gay, bisexual, transgender and queer persons. Read more.